Hopefully, you've found some graph paper, plotted the sights provided last time, and drawn a smooth and symmetrical curve through the points. If you did, you have drawn your first Noon Curve. What does this Noon Curve mean? It shows the path of Sun through the sky around Solar Noon on 12 July 2010. Before solar noon, the Sun climbed higher and higher into the sky; after solar noon, it began to sink again. Solar noon occurred at the instant the Sun crossed my meridian. At that moment, the Sun reached it's highest point in the sky. 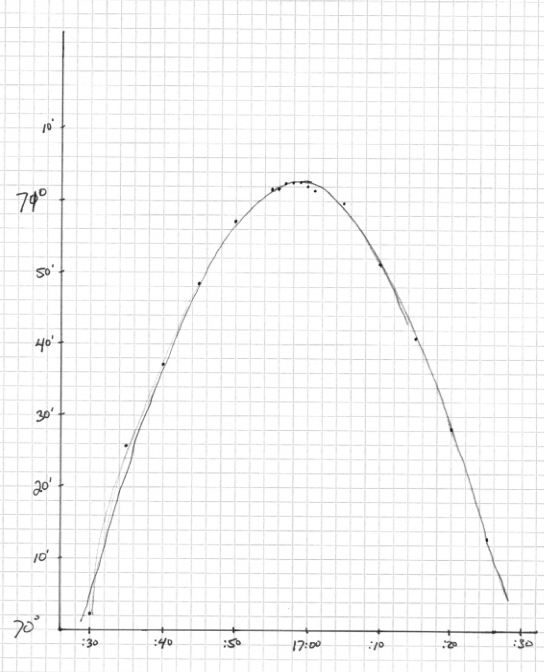 If you study the Noon Curve I've drawn, you will see that the top of the curve flattens out. The Sun seems to 'hang' in the sky at the top of the curve, for a minute or so. In fact, two of my sights had the same value: 71° 2.6'. In fact, this flatness reveals a limitation of the sextant. The Sun actually continued to climb until exactly solar noon, but the changes in height were too small to be measured by an ordinary sextant. First, it's relatively easy to deduce the height of the Sun at solar noon. This makes it possible to determine your latitude with a fair degree of accuracy. Second, it's more difficult to determine the exact moment of solar noon. When exactly did the Sun reach it's peak? 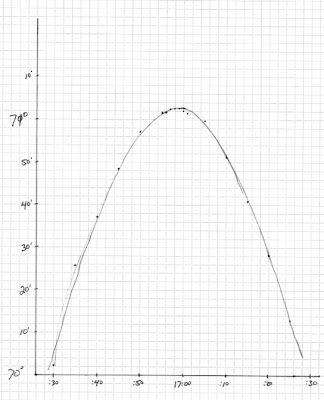 It's impossible to tell just by looking at the top part of the curve. If we guess the wrong time, our position could be off by miles. Pretty obviously, Hs was 71° 2.6'. The set of sights we are working with are nice and clean because I took them whilst standing on firm, unmoving ground. Sights taken from a moving boat are bouncier -- sometimes much bouncier -- making it impossible to just pick off Hs from the raw data. But for our Hello World! problem, these sights are perfect, and let us see the flat, top part of the curve more clearly than sea-shot sights would have. So, Hs is the height of the Sun above the horizon, as seen through a sextant. But this number is distorted by 5 errors that must be corrected for. Whole blog posts could be written about each error, but for our Hello World! problem we will just discuss them briefly. 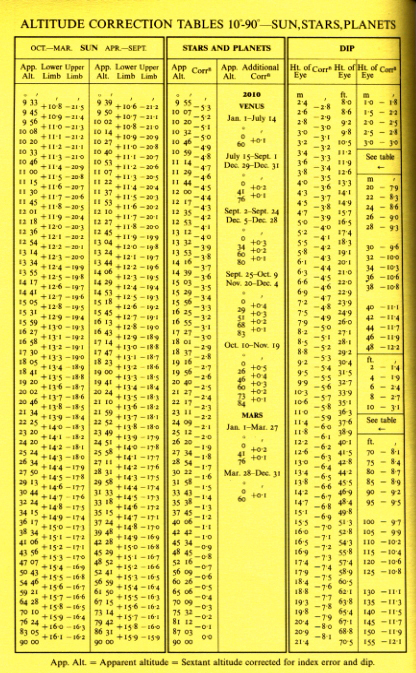 Index Error: we already discussed this error, which is an error in the sextant, itself. I determined before taking my sights that the index error was 1.2' off the arc. 'Off the arc' means that the sextant's actual 0 point (the index) was 1.2' below the '0' marked on the arc. That is, the actual index was off the arc. Get it? This means that all our measurements were 1.2' too high and we need to subtract 1.2' from Hs to correct for this error. If the error was on the arc, then the sextant's actual 0 point would be above the '0' marked on the arc. I.e., the actual index was on the arc, and all our measurements were too low. Saying on or off the arc makes it easier to visualize the error, and thus the correction, making it less likely you will apply the wrong correction (which would double the error!) so take a bit of time to understand this wording. Dip Error: as discussed previously, the only place you can get an accurate view of the horizon is with your eye at the suface of the water. I took my shots from 6' above the water, so the horizon I saw was below the horizon I would have seen, if I was in the water. This made Hs a bit higher than it should have been, so we must subtract a bit, to correct this error. But how much should we subtract? 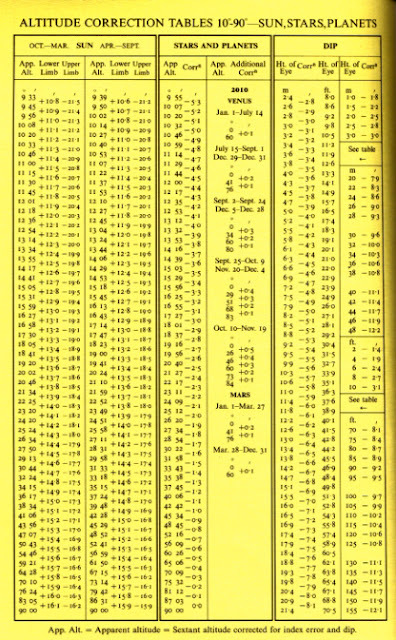 The Nautical Almanac has a handy DIP table that lets you look up this correction. So, as it says on the bottom of the correction page, Apparent altitude is the Sextant altitude (Hs) corrected for both index error and dip. So, how am I doing? Too fast? Too slow? We are starting to get into the math with this post, but I think I've kept it pretty simple and understandable. At least, I hope I have! If you are still with me (and Google tells me that several hundred people are following this thread), please shoot me an email (john@unlikelyboatbuilder.com) and let me know how I'm doing. I'd love to have your feedback, and it would help make the rest of these Celestial navigation posts better. All feedback, good and bad, much appreciated. I'm following along, pace is good. Question: shouldn't the apparent altitude be 70 deg 59.0'? Oh, whoops! You are 100% right, Steve. That's how positions end up being off by 60nm or so! Being a retired software enginerd, I've done "Hello World" in more computer languages than I can remember. Almost all were exercises in getting two words of text displayed with minimal learning or effort, sometimes within 7 minutes of cracking open the "manual." Changing the text size, color, font, spacing, etc. always came later. Learning about error detection and correction (dips or not) always came later. So, here we are 11 days and 7 blog entries into this and we still have nothing displayed. "Hello World" in 360 Assembly Language got results faster than this. Yeah, I'm impatient and grumpy. Take us to actual results quicker, then add the fine points of error correction, how sextants work, and the internal construction of H1. And for those folks that need some sort of notification about when you publish, a very short lesson on RSS subscriptions might help. RSS makes it a lot easier than special subscription processes. I'm still with you, keep them coming. The pace is just fine. I am able to learn each step, put it all together and do some 'extra work' on my own so it all makes sense. For whatever it might be worth, John's "lessons" are interesting, celestial navigation is not all that difficult, if it were, I couldn't have learned anything about it. That having been said, readers might find looking into courses offered by the local branch of the U.S. Power Squadron (usps.org) worth a look.